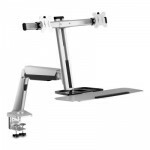 The Sit-Stand Mount Dual Gas Spring workstation desk mount from V7 allows you to easily convert your workstation from sitting to standing throughout the day. 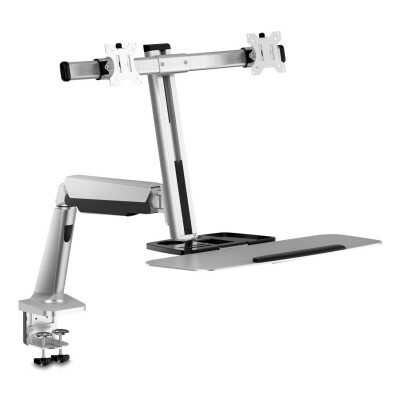 Designed to provide an ergonomic work environment, it holds up to two 27" displays that can easily swivel, tilt and rotate to optimize viewing angle. The mount also features a lower keyboard and mouse tray with micro level adjustment for getting just the alignment just right. The additional tray is perfect for papers or other office items, and it also features cable management clips for organizing cords and keeping them out of view â€“ a must for keeping your workspace looking good.